38 Short Colt ammo, also known as 38 Short centerfire cartridge was a round designed with a very specific purpose. The round was designed to work with black powder cap and ball conversions that became popular in the post Civil War United States. The cartridge was designed to work with the Colt 1851 Navy Revolver after the conversion from cap and ball to metallic cartridges was performed. The 38 Short Colt is a rather anemic load with a 125 grain cartridge being pushed at just 775 feet per second. The 38 Short Colt became popular mostly because of the ease of conversion from 1851 revolvers. Colt also introduced the more compact Colt New Line revolver, which was a superb pocket weapon for gentleman. This revolver was one of the first Colt produced weapons that utilized the self contained metallic cartridge. The round proved to be popular for concealed carry since it was easy to shoot from small revolvers with little recoil and muzzle blast. 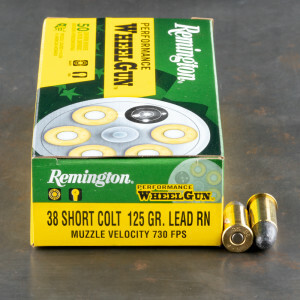 The 38 Short Colt cartridge is still produced by Remington in it’s original loadings. The round can be fired from the more modern 38 Special revolvers. The round is also popular in the Single Action shooting society, which the Colt New Line makes frequent appearances.